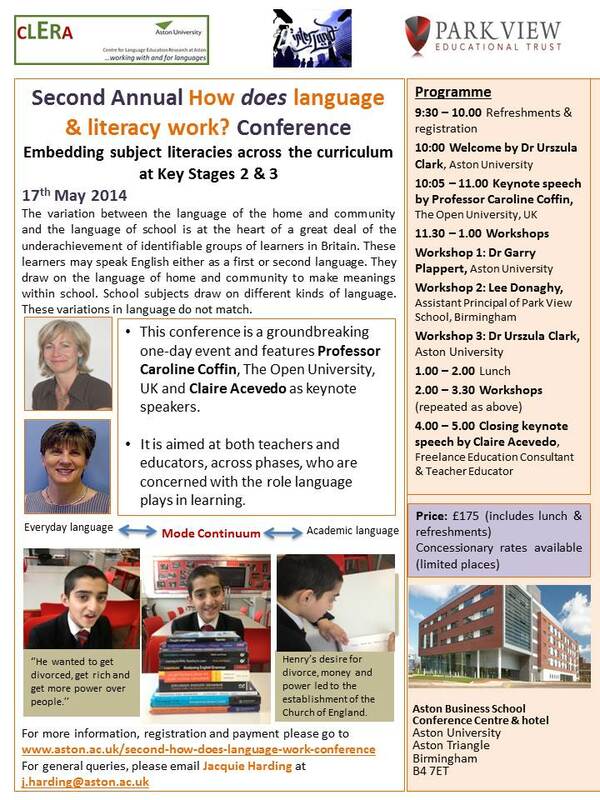 On behalf of CLERA and InterLanD (School of Languages & Social Sciences), Dr Urszula Clark hosted the second annual conference on the topic: ‘How Does Language & Literacy Work?’ on 17th May 2014. The conference continues the ground breaking collaboration begun last year between University researchers, providers of continuing development programmes in teaching English as an additional language and teachers across the primary and secondary sectors. Make the workings of the language system explicit in order to appreciate the role language plays, in constructing knowledge across all learning areas. Build understandings about the patterned ways meanings are made within and across genres so that educators are able to develop students’ language resources to understand and produce those genres. Enable participants to understand and use the differences between spoken and written language, both as a teaching and a learning tool. This year’s keynote speakers were Caroline Coffin, Professor in English Language and Applied Linguistics at the Open University, UK and Claire Acevedo, Freelance Education Consultant and Teacher Educator. 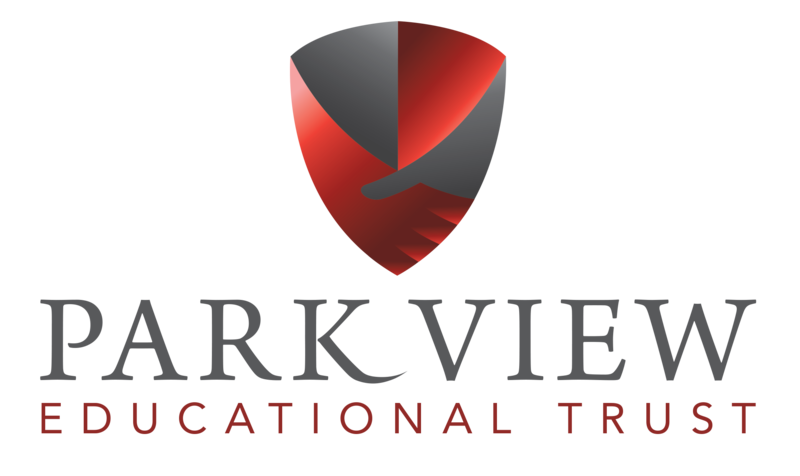 There were also a series of workshops run by Dr Garry Plappert and Dr Urszula Clark, Aston University and Lee Donaghy, Park View Academy, Birmingham. During the conference, there was plenty of opportunity for discussion of a range of issues in the field. Many thanks go to Dr Urszula Clark for organising the conference and to all the speakers and delegates who gave up a warm, sunny Saturday to attend. Due to last year’s success, another CPD workshop called ‘Teaching Grammar through Reading at Key Stage 2’ workshop was held on Wednesday 9th April 2014. 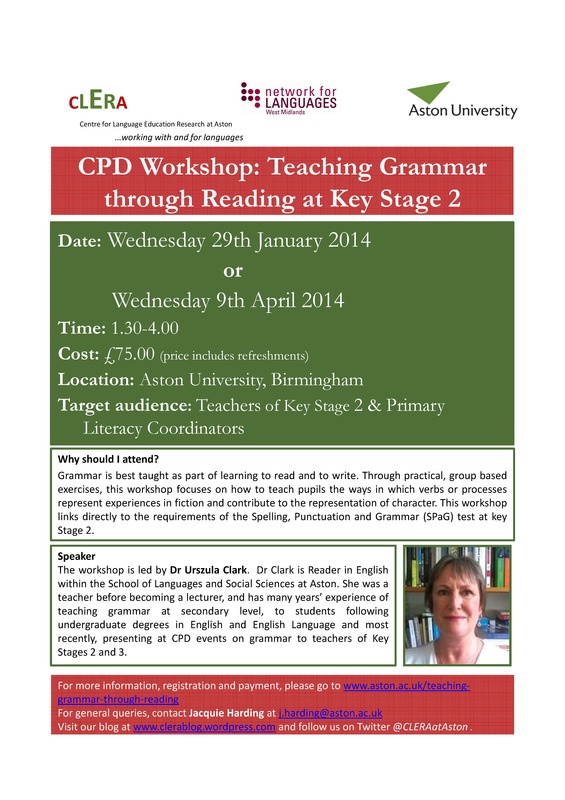 The workshop was run by Dr Urszula Clark who is a Reader in English at Aston University. She also has many years’ experience in teaching English grammar. The aim of this event was to help Primary school teachers prepare their pupils for the Key Stage 2 Grammar test that will be taken by year 6 pupils across the country in May.Through practical, group-based exercises, this workshop focused on how to teach pupils the ways in which verbs or processes represent experiences in fiction and contribute to the representation of character. Delegates from seven different schools in the West Midlands and two university lecturers attended the workshop. One teacher said, ‘I’ve gained a better understanding of how I need to help KS2 students’ progress to KS3!’ Another teacher commented on how the session made her revisit her previous grammar and look at sentences in more detail. Many thanks go to Dr Urszula Clark for making this workshop such a great success. Wednesday 19th March 2014 was Deutsch International! This was the final in a series of Routes into Languages cultural events in collaboration with Network for Languages and the Centre for Language Education Research at Aston University (CLERA). The event was for Year 8 pupils of German and featured three workshops from Aston students and native speakers from German speaking countries around the world. The countries covered were Belgium, Austria and Germany. The aim of the event was to show German as a world language and inspire pupils to continue studying German at school and beyond. We were very fortunate to have Alex Pickering, the Special Projects Advisor from the Goethe Institut in London,who kindly came to talk to the teachers while the students worked in their groups. Alex was also responsible for judging the best poster created by the pupils and the best speakers of German. On this occasion, the winning country was Belgium. Congratulations to them on such a wonderful team effort! The event was a great success: sixty pupils and eight teachers from local schools turned up on the day. Many thanks to Jenny Price and Elpiniki Lamproglou for leading the event; to Alex Pickering for his time, wonderful CPD inputand professionalism;to the student ambassadors for running the workshops and of course to all the pupils and teachers who made the effort to come and make this event worthwhile. ¡Una Fiesta Hispánica at Aston University! 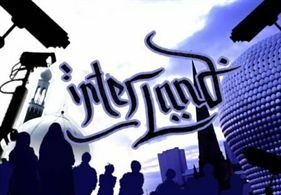 Wednesday 12th March 2014 was the second in a series of Routes into Languages cultural events in collaboration with Networks for Languages and the Centre for Language Education Research at Aston University (CLERA). The event was for Year 8 pupils and featured three workshops from final year students and native speakers from Spanish speaking countries around the world. The countries covered were Chile, Peru and Colombia. The aim of the event was to show Spanish as a world language and inspire pupils to continue studying Spanish at school and beyond. We were very fortunate to have Natalio Ormeño Villajos, the Education Advisor from the Spanish Embassy Education Office who travelled from Manchester to talk to the teachers while the students worked in their groups. Natalio was also responsible for judging the best poster created by the pupils and the best speakers of Spanish. The event was a great success: sixty-two pupils and eight teachers from local schools turned up on the day. Many thanks to Jenny Price and Elpiniki Lamproglou for leading the event; to Natalio Ormeño Villajos for his time, generosity and professionalism; to the student ambassadors for running the workshops and of course to all the pupils and teachers who made the effort to come and make this event worthwhile. Wednesday 5th March 2014 was the first in a series of Routes into Languages cultural events in collaboration with Networks for Languages and the Centre for Language Education Research at Aston University (CLERA). The event was for Year 8 pupils and featured three workshops from final year students and native speakers from French speaking countries around the world. The countries covered were Belgium, Congo and Martinique. The aim of the event was to show French as a world language and inspire pupils to continue studying French at school and beyond. We were fortunate to have Yves Letournel who came from the Cultural department of the French Embassy to talk to the teachers while the students were enjoying their workshops. Yves was also responsible for judging the best poster created by the pupils and award prizes. The event was a great success: sixty pupils and ten teachers from local schools turned up on the day. Many thanks to Jenny Price and Elpiniki Lamproglou for leading the event; to Yves Letournel for his time, generosity and dynamism for the teachers; to the student ambassadors for running the workshops and of course to all the pupils and teachers who made the effort to come. We hope to repeat the event next year.